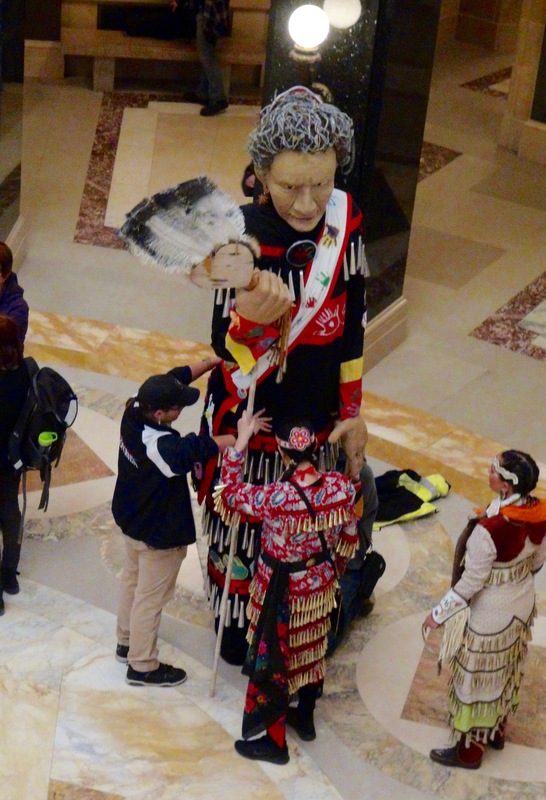 On March 26, 2019, the Madeline Island Jingle Dress Dancer appeared in Madison on her first visit to the capitol to promoting healing. She was invited by WISDOM, a grassroots organization comprised mostly of religious congregations of many denominations, which works to have a common voice on issues of social justice. In all, WISDOM includes participation from about 160 congregations, of 19 different religious traditions. The jingle dress dance is an Anishinabe tradition said to have emerged around the me of World War I. A young girl grew very sick, and her father received a vision to save her of a dress made with rows of metal cones, called ziibaaska’iganan, that jingle as the dancer moved. His daughter recovered and the jingle dress dancers have continued to practice this custom with purposeful intent to call in the healing spirits through the movements of the dancer. The jingle dress dancer is indeed a medicine of and for the people, and for the healing of indigenous people and spaces surviving assimilation and removal policies imposed upon them. The Madeline Island Jingle Dress Dancer dancing on Treaty Day, September 30, 2018 on Madeline Island, WI. The Madeline Island Jingle Dress Dancer is a creative build of a 12’ jingle dress dancer. Her dress, medicine bag, mocs, leggings, belt, hairpiece, and feather fan were super-sized and re-created by traveling to community venues across Northern Wisconsin, engaging people in her creation and construction as artwork throughout the spring and summer of 2018.. The community gathered again for a two-week program on Madeline Island for her final phase of construction. Each stop offered an opportunity for any and all community members to join in. She debuted on Madeline Island on Treaty Day, September 30, 2018. This project was originally inspired by Native and non-Native community members coming together to find solutions to understand the differences between our two cultures. She is currently on a cross-cultural, multi-commUNITY tour, going where healing spirits are needed. 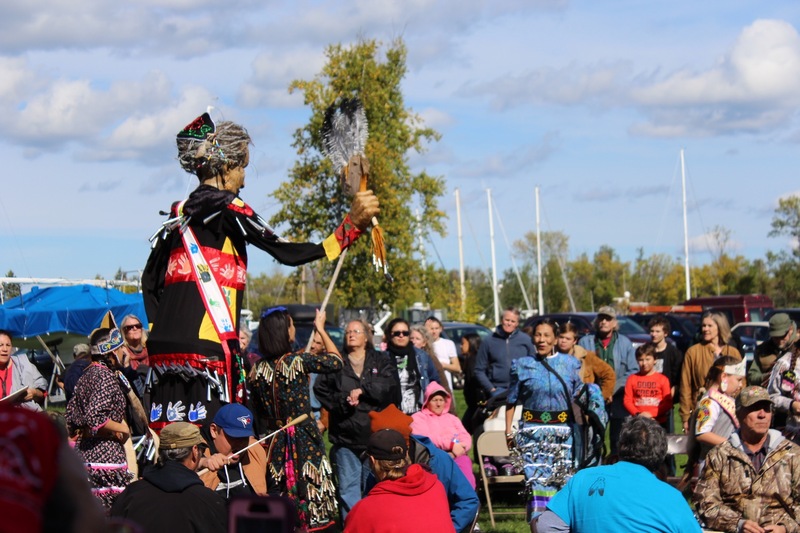 For more information about bringing the Madeline Island Jingle Dress Dancer to your community, contact Barbara With @ 715 209 5471 or Katherine Morrisseau at 715.373.0138. The Madeline Island Jingle Dress Dancer Project was made possible in part by generous donations from the 12 Tribes of Wisconsin, The Bad River and Red Cliff Bands of Lake Superior Chippewa, the Anishinabe Fund of the Duluth Superior Area Community Foundation, Honor the Earth, Native American Education Technologies, Inc, Mad Island Communications, Manypenny Bistro, Big Top Chautauqua, and Madeline Island Candle Company.